Meatballs à la Dijonaise. Photo by Richard Swearinger. I described some wonderful Boules de Picolat that I loved and adored in the Catalan region of France: Beef-and-pork meatballs in a tomato sauce with green olives and mushrooms. 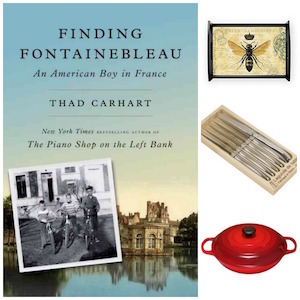 David Baruthio is from Strasbourg, France (near the French/German border), and while he says that the cuisine du midi (the cooking of southern France) is his favorite, I’ve noticed that the cooking of northern and eastern France often fires his imagination, too. 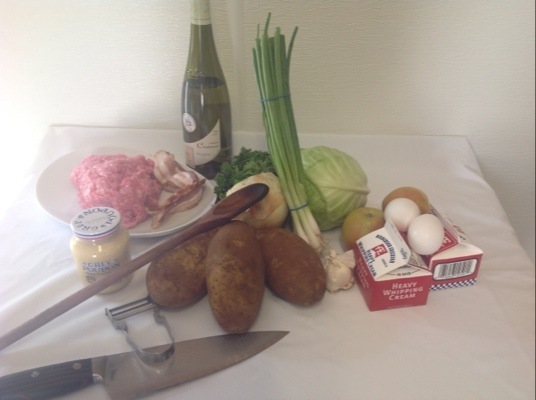 Before we knew it, we were buying cabbage, bacon (the fattier the better, he said), potatoes, Dijon mustard, cream, and a few other ingredients for a dish that ended up being of Alsace-Burgundy inspiration. We got back to his restaurant, Baru 66, and assembled the ingredients. As you can see, in the photo below, there is definitely something missing…..But what? 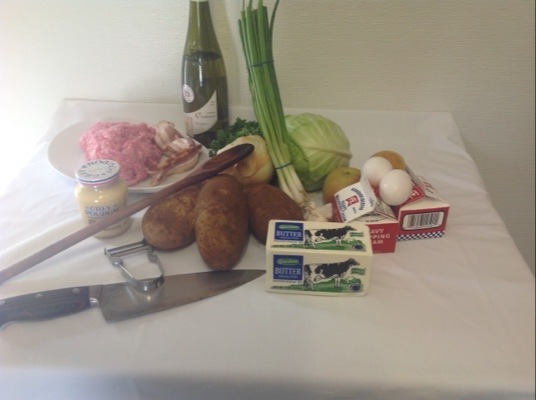 The missing ingredient appears in the photo below. Can you guess spot it? Ah Oui. Du beurre. The butter. A key ingredient in the meal, though we only used it in the potatoes. 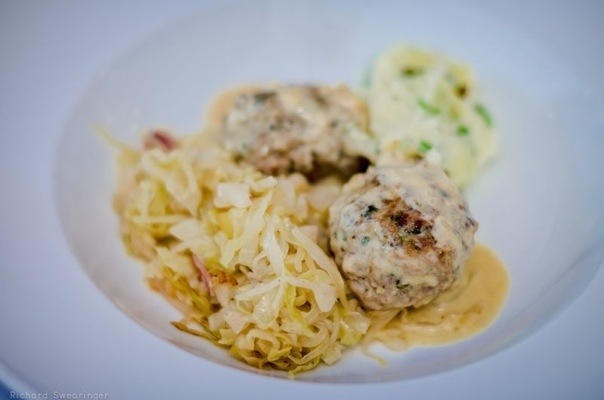 Here we go, for a complete meal that serves six: Dijon Meatballs, Alsatian-braised cabbage, and pureed potatoes. You’ll be ready to serve this in under an hour. First, we got the cabbage going. 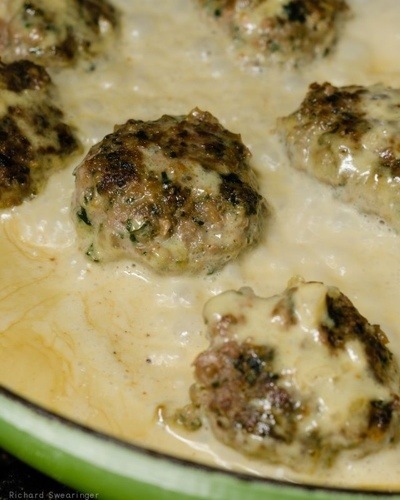 (Just skip to the meatballs recipe if you don’t want to make the cabbage). He covered the braiser, and put in in a 375°F oven, where it baked for 25 minutes (or until the cabbage was tender, and a roasty-toasty dry). This was about the time it took to cook the rest of our meal. Meanwhile, for the pommes purée, we had peeled and cut 3 large russet potatoes into about 2-inch pieces; we brought them to boiling and let them cook at an active simmer for 25-30 minutes (while we were doing other things). They were as tender as could be, which is where we wanted them. In a mixing bowl, we combined the pork, salt and pepper, parsley garlic and egg. 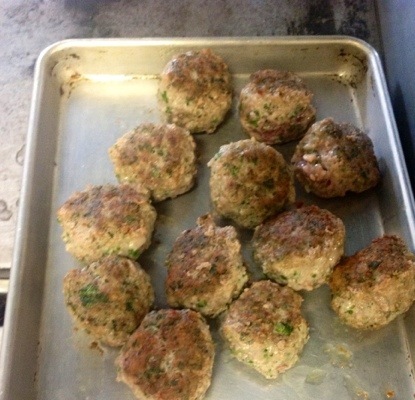 We mixed it all well together and shaped the meat into 12 meatballs. In 3 1/2-quart Le Creuset Braiser, we heated the vegetable oil over medium-high heat until the vegetable oil shimmered. (You can use a deep, heavy skillet with a lid; this one does not have to be oven-going.) We cooked the meatballs, about 3 minutes on each side, until they were light brown. (Don’t worry about the sides). The meatballs won’t stick to the pan, because you’re using so much oil (and more fat will be rendered from the meatballs). Fortunately, most of that fat gets poured off. Then we turned the heat to medium-low and let them cook, turning now and then, until they were nicely browned. (Again, don’t worry about the sides). 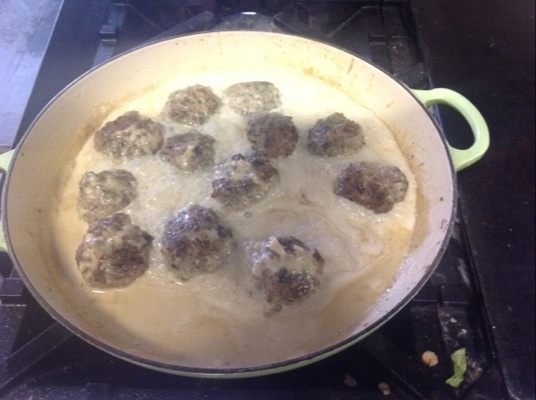 We took the meatballs out of the pan (below). 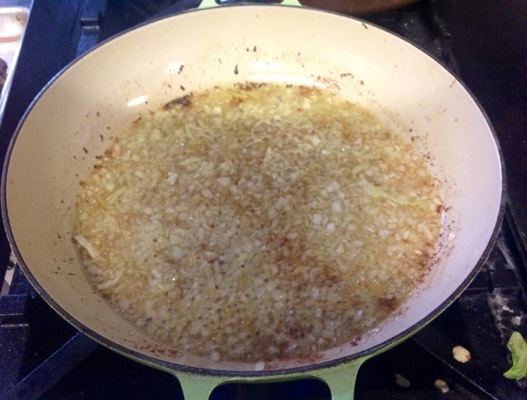 We drained all but a sheen of fat from the pan.To the pan, we added the onion. We let the onions cook over medium heat until tender, but not brown, about 3 minutes. We then added the wine and let it all simmer and cook down a bit. No Wednesday in the kitchen with David is complete without him muttering ah merde! under his breath at me, and he did that when he saw that I might have browned the onions too much. No huge worries. I just scraped the browned bits away—we didn’t want our sauce to get discolored. David whisked the Dijon mustard into the pan, and without batting an eye, emptied the cream into the pan as well. I started to freak out—it’s way more cream than I use in my recipes—but I calmed down after I realized that we’d be serving six people. That’s 1/4 cup cream each. Everything in moderation, right? We cooked the meatballs in the cream over medium heat, uncovered, about 5 minutes, or until the cream had reduced by about 1/3. Then, we covered the braiser; set the heat to low, and simmered the meatballs about 20 minutes or until done. Meanwhile, we finished those potatoes. We drained them, put them in a big bowl, added about 1/2 cup cream (David usually uses milk, he says, but the cream was handier at this point), and butter. How much butter? 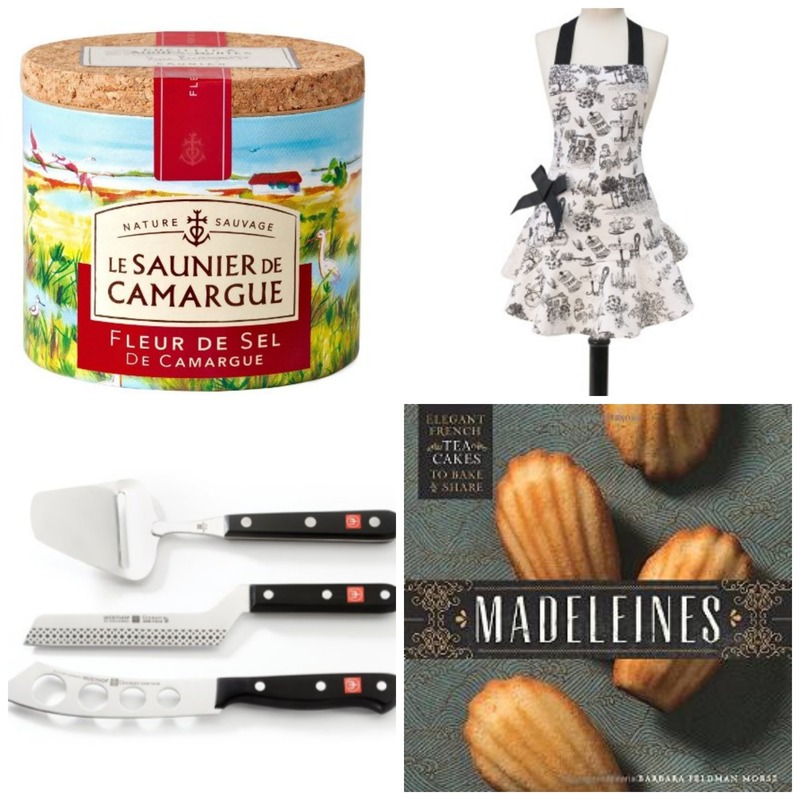 “For pureed potatoes, French people add as much butter as they do potatoes,” joked David. Not true, actually. We just used about 1/4 cup. The potatoes were so wonderfully tender at this late cooking stage, that they mashed easily with a potato masher that we had just picked up at a local supermarket. We sprinkled lots (maybe 3/4 cup or more) of green onions over the puree, as we thought our menu needed a jolt of color. 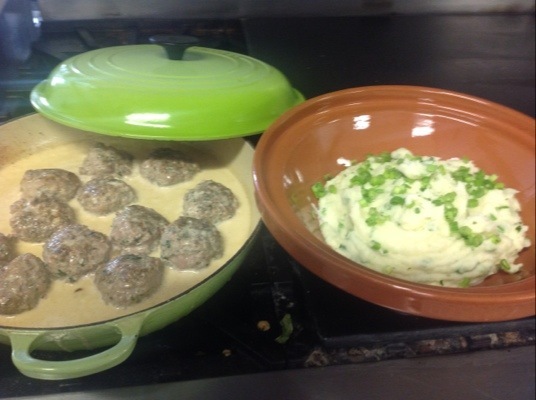 We served it up in bowls: Two meatballs per person, with cabbage, and a little scoop of potatoes. Amazing! Definitely a keeper! The only thing I might add, as we sat down to eat, was to watch the salt you add while cooking: Dijon mustard is very salty in itself, so keep it in check. And if you like this meatball recipe, you’ll love the recipes in my book: The Braiser Cookbook: 22 irresistible recipes created just for your braiser-great for Le Creuset, Lodge, All-Clad, Staub, Tromantina, and all other braiser pans. Nummy! The finished plate is somewhat monochromatic yet by simply reading the ingredients and method the flavors are Technicolored. 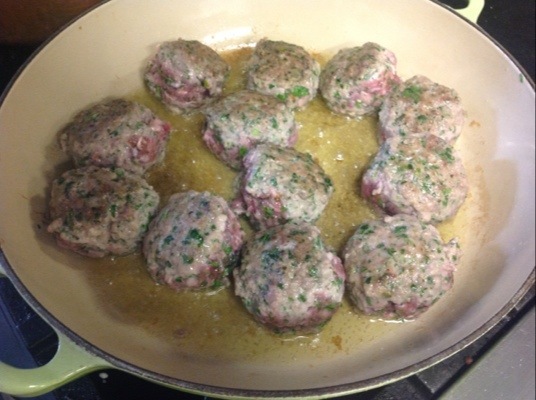 Now, about those Catalonian meatballs…? Just Wednesday?! NO day in my life is complete without an “Merde!” or two. It’s a very useful sort of word. 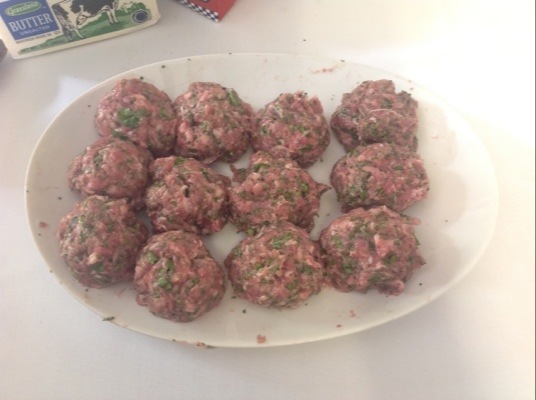 Chap–yes, I must post a recipe for Catalan Meatballs. In spite of what David says, I DO like green olives with pork, and the “boules au picolat” are really, really something…I’m dreaming of the now. Bon jour! I bought your book right before we moved to Paris..(a month ago! )…we have 4 children still craving American food! 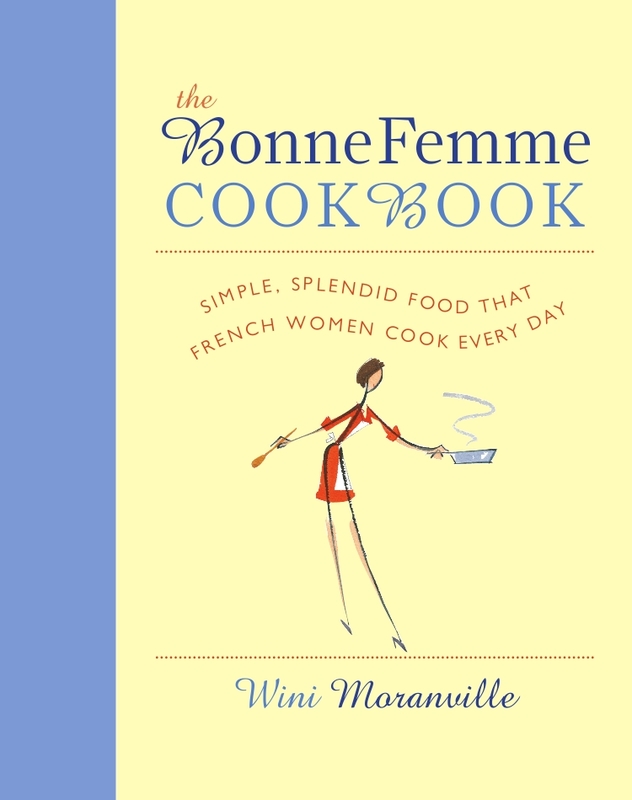 Your recipes have been a huge hit with the kids, not to mention making this Bonne Femme feel like a true French cook! Tonight we’re having the chicken and rice grande cassolette!! 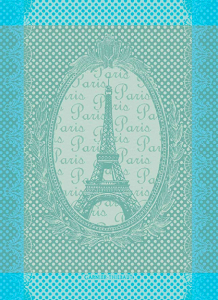 looking forward to following along with your blog..
Lucky you, Pamela, moving to Paris! Sounds fantastic. Thanks for your nice comments, and please do continue to follow the blog–there are some great recipes to come….I’m getting ready to post one now…. Recipe looks great. I will try this weekend. Does chopped apple go in same time as cabbage or just before going into oven? Are bacon slices diced? Oh for heaven’s sake. Terry, I’ve spent the last 20 years working on cookbooks, you’d think I’d have figured out how to write a recipe by now. Where’s an editor when I need him/her?! I’ve added the answers to the question, above. Thanks for point this out. Wini: Thanks. That’s what I assumed on bacon. 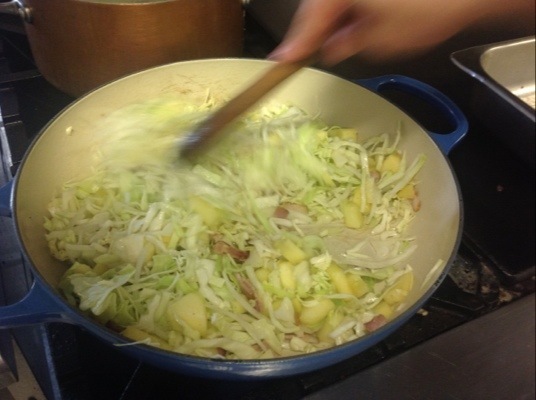 But wasn’t sure on apples, whether they went in braiser with cabbage or added just before going into the oven. I have to say, I was very excited to try this meal. Husband loved it; me, I found the cabbage pretty bland, despite seasoning it with salt and pepper. I am going to try the leftovers today, eating the cabbage and the meatballs with their sauce all together instead of separately like I did last night and see what that does for the cabbage side. The other thing is the timing was way off. My meatballs took longer to prepare and cook than the 25 minutes my cabbage was in the oven (plus I had to make my mashed cauliflower in place of the potatoes– which should have been quicker than the potatoes in your meal above). So I would recommend to anyone that they prep everything first, including meatballs, and then the timing is not an issue. Definitely a great way to use my ground pork from my meat CSA! Oh dear! Timings off? I’ll take another look. Thing was, there were two of us cooking, so it probably went faster for us. I’ll rethink it! Glad you enjoyed the flavor of the meatballs. 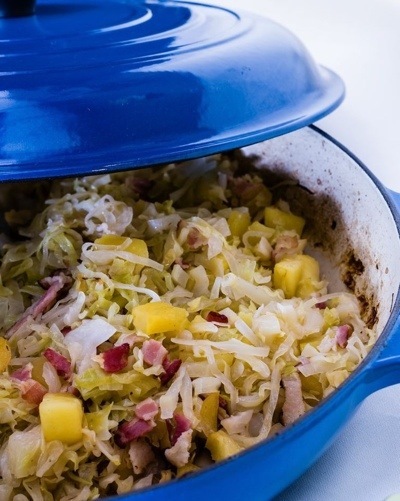 Too bad about the bland cabbage–even with the bacon? Thank you for trying it and thanks even more for your comments!